Other Common Names: Loosestrife, garden loosestrife, yellow willowherb, herb willow, willow-wort, wood pimpernel, lisimaquia amarilla (Spanish), lysimaque vulgaire (French), Gewöhnlicher Gilbweiderich (German), strandlysing (Swedish), ranta-alpi (Finnish), almindelig fredløs (Danish), fredløs (Norwegian). 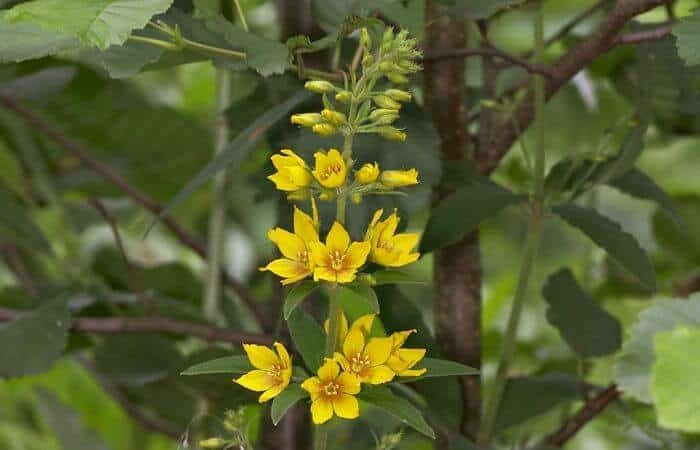 Habitat: Yellow loosestrife is native to Europe and North Asia but was introduced to North America in the 1900s for decorative purposes and soon became naturalized. The plant thrives best in wetlands, on riverbanks, lakeshores, and along beaches. Both yellow loosestrife (Lysimachia vulgaris) and its close relative large yellow loosestrife (Lysimachia punctata) are grown as garden plants due to their beautiful yellow flowers. Plant Description: Yellow loosestrife is an herbaceous perennial plant that belongs to the primrose family (Primulaceae). It can grow up to 150 cm tall (5 feet) and has a creeping rhizome with numerous runners (stolons) that produce branched erect stems. The leaves are ovate, narrow and green and the bright yellow flowers consist of five petals that form a cup. The flowering period is from June to September. Plant Parts Used: It is the dried leaves and flowers that are used medicinally. The whole above-ground parts are collected, mostly from the wild, when the plant is in bloom and dried for later use in decoctions and infusions. The herb is odorless but has a slightly bitter and salty taste. Active Ingredient and Substances: The dried leaves and flowers contain tannins, flavonoids (rutin, myricetin, quercetin, and kaempferol), triterpene saponins and benzoquinones. The plant contains vitamin C which explains its uses in the past as a remedy for scurvy. It is thought that the herb’s genus name “Lysimachia” derives from the old Greek name lysimakhion (“lysis” meaning dissolve and “makhos” meaning battle), which was used for both yellow loosestrife and purple loosestrife (Lythrum salicaria). According to myth, the medicinal properties of yellow loosestrife were first discovered by a man named Lysimakhos. Who he was and what role he played in history is uncertain but in ancient literature, he is referred to as a herbal doctor, king of Sicily or general in the army of Alexander the Great. 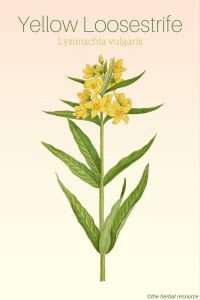 The Ancient Greek physician, pharmacologist and botanist Pedanius Dioscorides (40 – 90 AD) wrote about yellow loosestrife in his “De Materia Medica” (Greek encyclopedia about herbal medicine) where he recommends it for wound treatment and to stop nosebleeds, and also wrote that the smoke of the burning herb could keep snakes and flies at bay. Yellow loosestrife did not play a vital part as a medicinal herb during the Middle Ages and was first later used as a remedy for fever, diarrhea, and dysentery. Yellow loosestrife has similar medicinal properties and uses as moneywort (Lysimachia nummularia). It has astringent (contracting), expectorant and emollient properties and it is used primarily as a treatment for ailments related to the digestive system, such as diarrhea and dysentery. Furthermore, it can be used to clean minor wounds, cuts, and scrapes and halt nosebleeds and another minor bleeding, both externally and internally. In the form of mouthwashes, a tea made from the herb can be used as an herbal remedy for mouth ulcers (canker sores) and bleeding or inflamed gums. It is regarded to be useful as a relief for sore eyes and is thought to be of equivalent or maybe greater value than eyebright (Euphrasia officinalis). Yellow loosestrife is also known as a dye plant. The rhizome and the runners give a brown color, while the leaves and stems give a yellow color. As a tea (infusion): Add one or two teaspoons of the dried herb to a cup of steaming hot water. Allow the infusion (tea) to soak for about 10 to 15 minutes and then strain. If the infusion is intended as an eyewash, a little sea salt can be added to the mixture. Yellow loosestrife is considered a safe herb to use but as it contains a high amount of tannins it should not be used for internal medicinal purposes for prolonged periods. Excessive consumption of tannins may cause a deficiency of essential minerals in the body.